Cornercopia hosts various pop-up restaurateurs. Currently it is Blue Jay and they have not yet decided when this particular arrangement will end. Cornercopia is described in a number of previous posts (see here, here, here and here), so this time we will concentrate on the food. This is an easy restaurant menu – three starters, three mains, one dessert and a cheese option. 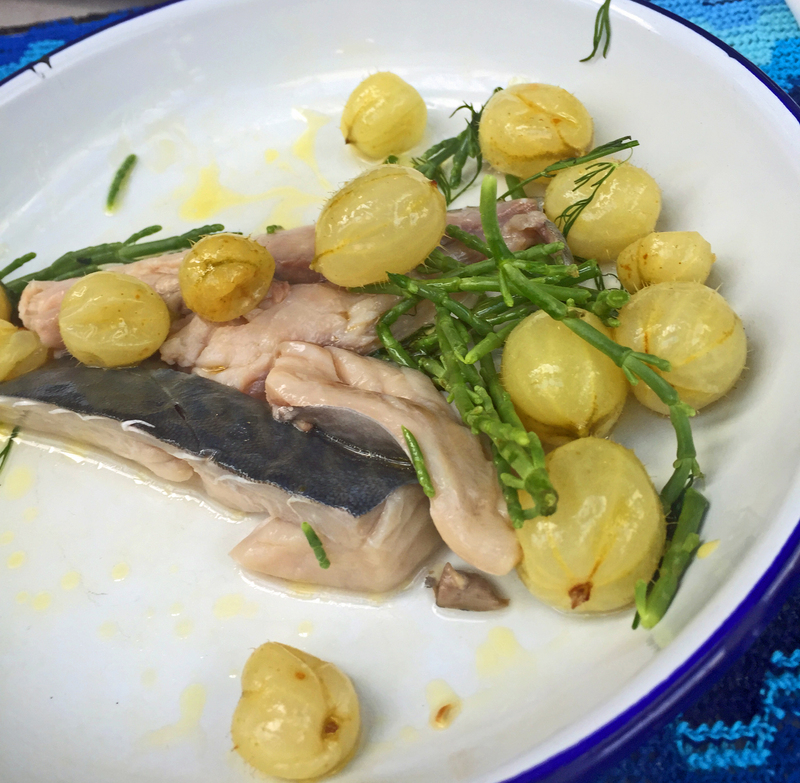 When we visited in July (and they plan to change them monthly) the starters were chicken BLT, mackerel with pickled gooseberries and samphire) and a veggie option. We chose the mackerel between us and it was really interesting and (as we were not starving) plenty for the two of us. Saying it was interesting might suggest that we couldn’t decide whether we liked it or not but we definitely did and would have happily had a larger portion for a main. 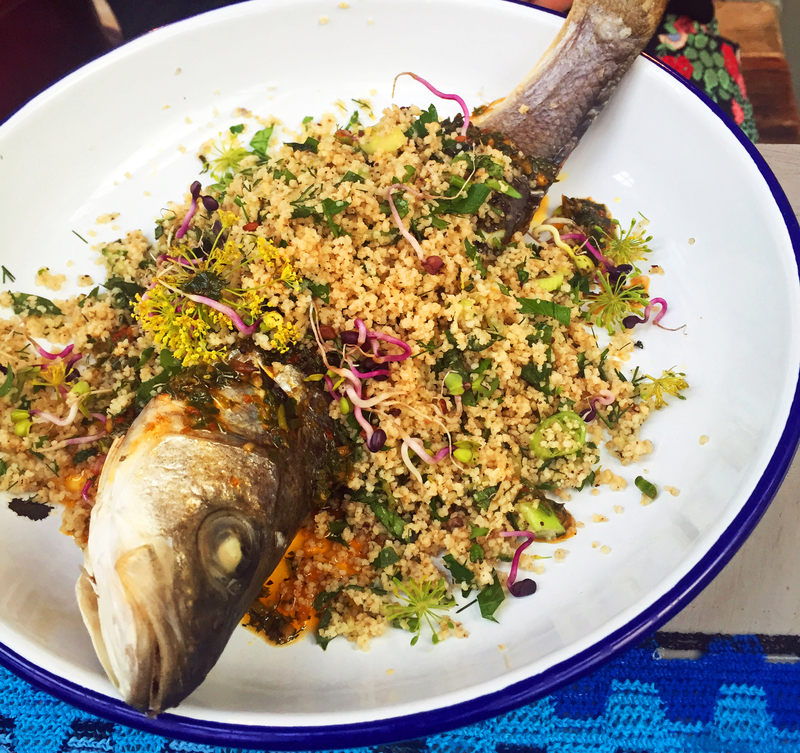 The same themes are also in the list of main – fish (sea bass, barley couscous tabouleh and braised fennel), meat (chilli rubbed braised pork shoulder, runner beans, shallot and hazelnut) and a veggie option (salt baked jersey royals, grilled courgette and sheep’s cheese). We chose the fish and the pork. The fish came whole on a plate not really big enough for dissection. They use the same enamel bowls they sell in their shop. I was given a separate dish to put the bones in but it still meant being very careful, warily chewing every bit slowly – probably good for the digestion but not for the enjoyment of the dish. The tabouleh/couscous was very good and a shame it wasn’t part of the veggie dish. The fennel was soft enough but gave a bit of texture too. 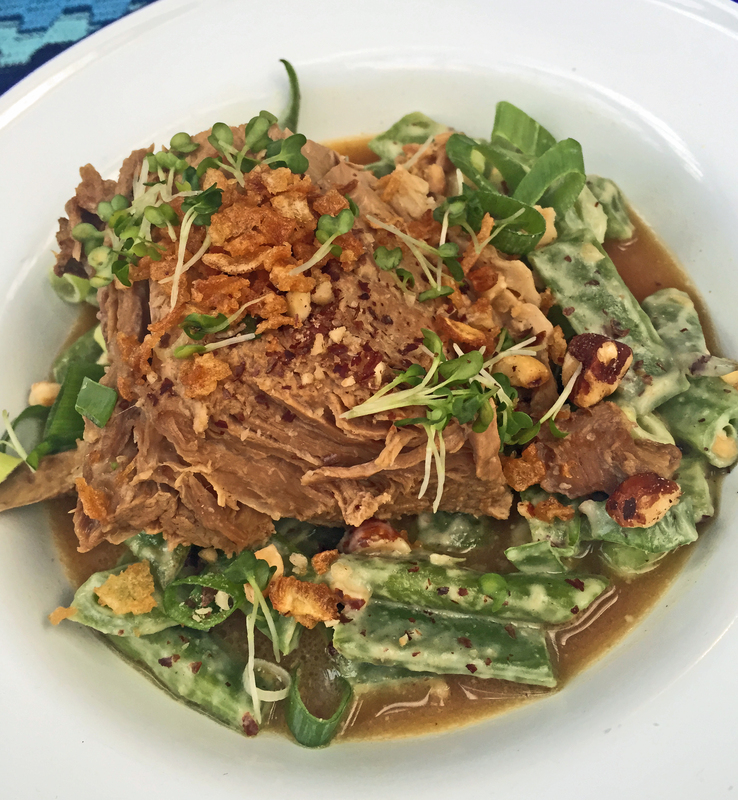 The roast pork was not too much to frighten off diners worrying about their waistline and while the sauce was tasty and the hazelnuts provided some texture, the flavours were muted and the runner beans were undercooked. The only offer of dessert was a peach with some “crumb” type thing so we stopped there and visited the Lab-G gelateria for pudding. We drank two glasses of rosé and a beer. The meal was tasty and interesting, but it came to a staggering £55.00 with service. Each of the mains was £12.00 and the starters began at £7.50. We are not averse to spending hard cash (they only take cash) for good quality food but we thought this was overpriced.